Uruguay is establishing itself as a trading nation of note, with investment flowing into the tiny South American nation. Of all Latin American nations, only Chile has attracted more foreign direct investment (FDI) as a percentage of GDP than Uruguay over the past two years, helped by a business-friendly investment climate. Commodities giant Trafigura has just announced the opening of a regional hub in the Uruguayan capital Montevideo, adding to its Houston, Geneva and Singapore offices. Mike Wainwright, the company’s chief operating officer, put the decision down to Uruguay’s “the depth of local talent, the mature legal framework, and the stable and secure environment for international businesses”. Uruguay’s location, sandwiched between the Atlantic seaboards of Argentina and Brazil, allows it to act as a bridge between the two, with the government keen to establish it as a regional logistics hub. It is planning to build a deep-water port that would compete with the likes of Buenos Aires and Porto Alegre, with Uruguay arguably offering more stability than its Argentine and Brazilian counterparts. Late last year, NZ Farming, a dairy-producing subsidiary of Olam, secured the country’s largest non-government syndicated loan, with a two-year US$100mn facility. The loan was arranged by ING and syndicated to Banco do Brasil, Bladex, Monte Paschi di Siena – all regional banks. 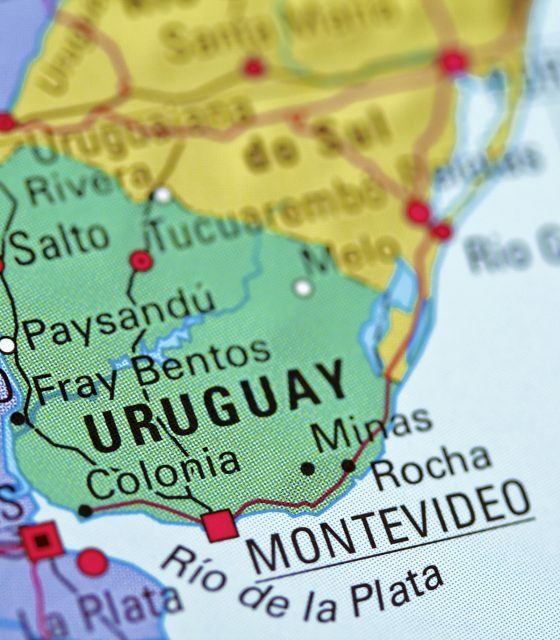 Edward Glossop, an emerging markets analyst at Capital Economics, tells GTR that the recent interest in Uruguay has helped the economy return to strong growth, but warned of dangerous by-products of this investment. Furthermore, he warns that while robust growth of 4.3% is forecast for 2014, the country is still vulnerable to downturns in the economies of its key trading partners, Argentina, Brazil and China. Combined, the three account for 57.8% of Uruguay’s total trade. Last year for the first time, China overtook Brazil as Uruguay’s major trading partner, accounting for 20.9% of the total volume. China invested US$68mn into Uruguay’s dairy sector and is a major exporter of its beef. Furthermore, China was the offtaker for 66.4% of Uruguay’s soy crop, pumping US$1.2bn into the local economy. With Brazilian and Chinese growth slowing in 2014 and analysts despairing over Argentina, there’s a fear that Uruguay’s nascent trade economy may need to diversify if it is to continue on its development path.